Larry D. Wolfe, President of Jet Hangar International, Inc., has been in general aircraft modeling of over 40 years, and with ducted fan modeling for approximately 35 years. As a helicopter pilot, he has 10 years flight experience including 2 years of duty in Vietnam where at the rank of Captain he accrued 2,000 combat flight hours. He has combined military and commercial flight time totaling in excess of 4,500 hours. Larry's business partner is his wife Cynthia Bertholf Wolfe. Cyndy, Chief Financial Officer of Jet Hangar International, holds a Bachelor of Arts degree in history from the University of New Mexico and a Master of Science in Recreation from the University of Illinois. She served two years in Vietnam as a Department of the Army civilian, and has been active in Jet Hangar International Inc. since 1975. In addition, Cyndy is active in the community. She has managed girls' softball teams, served on the Board of Directors of the Weingart-Lakewood YMCA, is past President of the Artesia High School Softball Boosters, and currently serves as President of the Artesia Band Boosters. Cyndy has also been active as Board of Education appointed representative to various ABC Unified School District committees. Larry's experiences with major aerospace firms have resulted in new concepts involving the utilization of model aircraft applications for use in full scale aircraft design. Working with the Northrop Corporation in Hawthorne, California, he constructed the proof-of-concept platoon-carrying aircraft in 1/10 scale utilizing twin ducted fans and special flaps incorporating a proprietary flap design so the aircraft would have STOL capabilities. The project was conceived to prove the concept of carrying a platoon-sized group and all support equipment including jeeps from unimproved fields to destinations over 1,000 miles. The aircraft was designed to provide a strike force capacity into a combat situation. From 1982 to 1986 he developed the concept validating use of radio control modeling in the development of full-scale advanced and negative stability designs for aircraft. 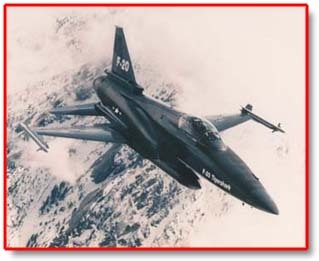 This specifically involved the building and flying of two 100% 1/8 scale F-20 Tigersharks which carried a Northrop designed $300,000 in-flight/computer which measured 9 channels of information. Quantitative and qualitative data was used for developing design and design changes in current and future (not yet flown) aircraft designs. This concept proved to cost approximately 1/10 that of traditional full scale methods. 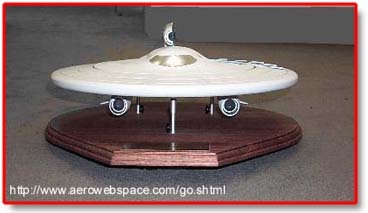 During 1986 while under contract to DeVore Aviation of Albuquerque, New Mexico, Larry constructed a 1/4 scale radio controlled flying model of "Sunbird", an experimental model used to develop a full-size aircraft for the general aviation market. The model was built from drawings of the proposed full-scale aircraft using a NASA designed airfoil. Also during 1986, ACA Industries of Torrance, California contracted with Larry to complete a defunct project of a diamond wing (Joined Wing Concept) model with a 10' fuselage, 8' wingspan, and weight of 23 lb. The first requirement was to refurbish and restore a previously inadequate work/design to flyable state. Extensive rework was necessary including refinishing of paint work. All test flights prior to take-over by Jet Hangar International had been unsuccessful due to problems with engines. Consequently, there was a need to rework the improperly adjusted engines and a successful test flight was made. However, in straight and level flight, the left wing member from the dorsal to the wing joint failed under compression loads, causing structural failure of the wing. 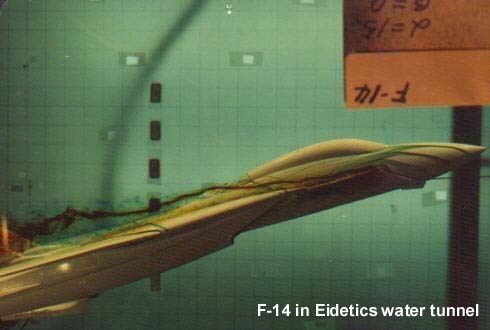 As a consultant to Eidetics Corporation, Larry developed models to prove design changes through water tunnel flow-visualization characteristics. He engineered and constructed a series of water tunnels and water tunnel models. These were supplied to California Institute of Technology and the University of Taiwan. 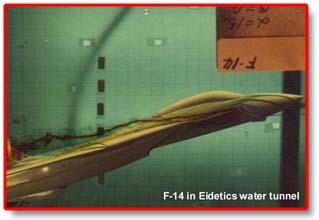 A "generic" water tunnel model allows multiple wing, stabilizer, and dorsal design changes to investigate extremely high angles of attack with relative wind. Because of the nature of these tests, any further information on the purpose of this model remains proprietary to Eidetics Corporation. This process was used to re-engine 207 A-4C Skyhawks for the Republic of Singapore. The study by General Electric Corporation proved by the in the flow-visualization test that the existing intake and duct liners to the face of the new engine would not need to be changed. Based on these tests, a competitive bidder was denied the contract based on their required inlet design changes. While under contract with Ford Aerospace and Communications, Larry engineered and constructed 4 scale models of the Hein D helicopter for the Chaparral Missile Program in Europe. These were designed to be target drones for instruction of military personnel in the operation of missiles. Concern with the environment also includes the model aircraft industry, and in that arena Jet Hangar International is no exception. In 1984 Aerospace Corporation contracted with Larry to conduct a program involved in collection of data on pollutants in the air by flying radio controlled aircraft through the atmosphere. Aerodynamic forces affect a model aircraft in the very same way as they affect full scale aircraft. Dynamic Engineering Inc. during 1982 contracted Larry to build a radio controlled 1/8 scale Piper Tomahawk featuring a full flying stabilizer that rotated 90 degrees to the relative wind. This type research investigated "deep stall" phenomena. The process involved the total departure from flight with the ability to maintain control of the aircraft during its vertical descent. Douglas Museum at Santa Monica Airport, restored an F-4D Skyray for United States Air Force, Wright-Patterson Air Force Base, Dayton, OH, restored and repainted an F-15 Eagle to new specifications and for the Vought Corporation (A Division of LTV), restored an A-7D Corsair II research model. Larry has also developed and created models used in the Hollywood Film Industry. His credits include "Weird Science" (1995) where he developed and created 5 model aircraft to match the script parameters for blue screen and actual flight sequences. In "Hot Shots" (1991) he created all F-5 and Foland Gnat miniature aircraft used in the movie production. These aircraft were used in concert with blue screen special effects. Larry has also done international film work. For "Novela" (1990), a requirement for Mexican television series was to build and fly 1/8 scale Lear jet. The script required the dangerous task of crash landing the jet while flying it toward the camera. 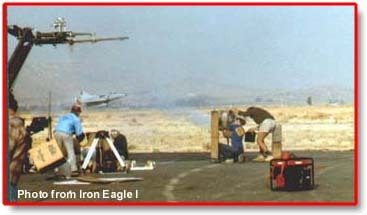 "Iron Eagle II" (1988) required Larry to provided 7 miniature aircraft--1 F-4, 2 F-16's and 4 KFIR's for special effects. A special requirement included filming of flight shots of models carrying pyrotechnics including in-flight explosion of an aircraft on cue. For "Shannon's Deal" (1987), Larry provided all aircraft for specific museum shots comprised of approximately 20 model aircraft from WWII to present. One of the most popular movies involving aircraft is "Iron Eagle" (1985). Larry developed 6 radio control aircraft, one Cessna 152, three IAI KFIR models, and two General Dynamics F-16B's for special effects. The F-16's were created in 1/10 scale, per requirements of Falcons Flight. They were rigged to fire sidewinders, maverick missiles, and drop bombs, in addition to being flown. They were further rigged to be destroyed using radio control pyrotechnics. The KFIR models were built using "Jet Hanger International" kits and were also rigged to fire ordnance. One of the most popular movies of all time is "Top Gun" (1985). Larry developed and coordinated the construction of plugs and fiberglass molds for 1/13.5 scale F-5E Tiger II and 1/10 scale F-14 Tomcat (with swing wing capability) for Paramount Studios. 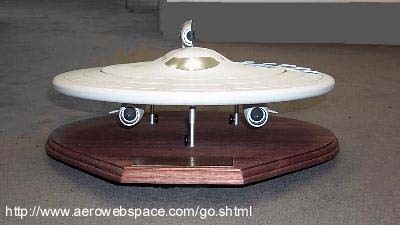 The original intent was for these models to be flown by radio control. Ultimately the special effects were assumed by USFX. Larry designed and engineered the special aircraft for the movie "Firefox" (1981). He designed internal engineering on a script aircraft which proved to have poor aerodynamics. The challenge of making if fly was overwhelming and despite these odds, the Jet Hanger International design flew satisfactorily. The flight sequences were done by Larry in Thule, Greenland, as part of the film crew for filming of the special effects. Larry worked with UCLA/Boeing and NASA developing and constructing a prototype ultralight aircraft for use as telecommunication relay platforms for cellular communications. The aircraft designated "The SPFF" would fly in formation (one following the other to take advantage of upwash created by the preceeding aircraft) with other UAV'S on preplanned routes above cities. The prototype UAV has a 44-foot wing span and is constructed of tubular spars and graphite-epoxy ribs covered with mylar. The SPFF has an inverted V-tail attached to a tubular fuselage and a payload compartment located below the center of the wing span. Also, a pusher prop was mounted aft of the V-tail. The UAV was successfully flight tested at El Mirage Dry Lake in the Mojave Desert in California on November 19, 1996. Currrently, Larry is residing at home and focusing all of his efforts towards Jet Hangar International, Inc.